A healthy diet plays an important role in addiction recovery. 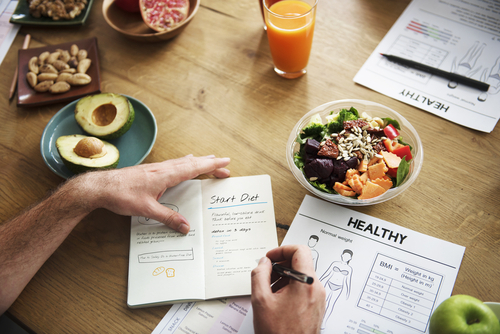 In the journey from detox to regaining sobriety, you need to adhere to the diet plan that your therapist lays down for you. Organs affected by substance abuse get nourishment from nutritious food. Healthy eating habits will vary with the nature of the addiction you are trying to overcome. Opiates such as heroin, codeine, and morphine damage the gastrointestinal system. Users complain of constipation. During the withdrawal phase, recovering addicts experience loose motions and nausea. Due to these, the body may experience an electrolytes imbalance and a paucity of nutrients. A balanced diet with the right breakup of calories coming from fats, carbohydrates, and protein will help immensely. Fiber will help get the digestive system back on track. Eating is difficult because of the nausea but the subject must make an effort. Alcohol abuse ranks among the major reasons for poor health. Alcoholics are invariably deficient in the B vitamins, which results in anemia and issues related to the nervous system. The liver and pancreas, two important organs of metabolism, get damaged with alcohol abuse. Toxins build up in the body, blood sugar levels are not regulated properly, and hypertension occurs. Women run the risk of calcium deficiency and osteoporosis. Alcoholics are usually deficient in important nutrients like iron, protein, and electrolytes. The diet has to address these issues and also ensure that liver health is restored. Stimulants such as cocaine act as appetite suppressants. This results in the addict losing weight and gradually becoming deficient in nutrients. Dehydration and electrolyte imbalances occur. A protein-rich diet with essential proteins and those used for the creation of neurotransmitters is recommended. Staying hydrated and spending time in the sunshine are recommended. Marijuana abuse leads to an increase in appetite. Consistent users of marijuana may gain weight and suffer complications related to obesity. Dieting and exercise are recommended for those trying to quit marijuana. Eliminating processed foods and sugars is an essential aspect of a healthy diet for recovering from any addiction. Once a person starts getting used to a healthy diet and an active lifestyle, he automatically feels like staying away from substance abuse. Maintaining a diet plan requires discipline. Organs have to be nurtured back to a state of health. The brain has to readjust to a complete cessation of signals induced by the drugs and alcohol. The body will find it difficult to regain its original state of homeostasis. Diet helps a lot. Sticking to it is, therefore, crucial. Any prescribed vitamin and protein supplements must be taken on time. Do not cheat by treating yourself to a sugar-laden treat or fried fast food. Organs that are on the path to recovery may find the sudden load too much to take.